European Festival Awards published the nominations for best festivals of 2012. Festival Lent was nominated for Best Major European Festival. Festival Lent is the only Slovene festival to be placed on the prestigious list of nominated events in the category Best Major European Festival and therefore qualifies for the European festival Award 2012! 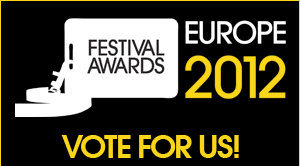 Voting will be open until November 7th at http://eu.festivalawards.com/vote. The awards will be announced and presented by the European Festival Association (http://eu.festivalawards.com/), which is the only European organization solely dedicated to recognizing the contributions and achievements of the event organizers and performing artists at (mostly summer) festivals. Since 2009, the combination of judges and voters has annually decided on the best festivals and performers. Last year, they recorded over 350 000 votes for over 200 nominated festivals in different categories. This year’s awards will be announced at Oosterport Congress Centre, Groningen, Holland, on Wednesday 9th January 2013. In addition, the band DOPE D.O.D. that also performed at our festival at Mladina stage on June 24th 2012, happens to be one of the nominated bands for Newcomer of the Year.